The House-Senate conference committee negotiating the final language for the spending bill that contains an anti-Johnson Amendment provision, H.R. 6147, continues to argue over the details of the bill. It has been confirmed that the extraneous rider that would politicize religious and other nonprofits is very much an “open” issue, meaning that conferees have not agreed to remove the language or keep it in the final bill. Early last week, word circulated that Republican leaders had decided to postpone final decisions on the legislation until after the elections and were planning to add much of the spending provisions to a stopgap spending bill, known as a continuing resolution or “CR,” that would fund the government through December 7. There appears to be agreement that a CR will include all appropriations bills that cannot otherwise be resolved in conference committees and passed by the September 30 end of the federal fiscal year. The House and Senate conferees on H.R. 6147 met late last week and were instructed to keep trying to work out their differences. Their decision on the anti-Johnson Amendment provision can go one of three ways in the coming days: 1) strike the House-passed anti-Johnson Amendment language and pass the fiscal year 2019 appropriations bill by September 30, 2) include the offensive language in a bill that is enacted before September 30, or 3) avoid making a decision until after the elections and maintain funding at current levels by including the relevant federal departments in a continuing resolution. Nonprofits in states with members of the conference committee on H.R. 6147 (see states marked in green on this map) have a unique opportunity to stand up for all nonprofits nationwide. Click on the map to find contact information, pre-loaded tweets for each conferee, and links to individualized Community Letters. Nonprofits now know the answer to the question of what’s happening to charitable giving. “Research on giving in the United States has now produced definitive empirical evidence to show a decline in the participation and amounts donated by ‘small’ and ‘medium’ (actually, median) donors and an increasing reliance on ‘large’ donors,” writes Patrick Rooney in “The Growth in Total Household Giving Is Camouflaging a Decline in Giving by Small and Medium Donors: What Can We Do about It?,” published last week by Nonprofit Quarterly. Rooney’s research finds that over the past fourteen years (the period for which data exist), there has been a decline in the percentage of Americans who are donating and a decline in the amounts donated by the typical American household. That trend has been largely hidden by growth of total giving overall (thanks in part to several mega-gifts every year) and the aggregate number of households giving. The article reinforces the common view that by reducing the number of people who take the itemized deduction, the tax law enacted last December is likely to exacerbate the decline in the number of households who donate to the work of charitable nonprofits. In the Nonprofit Quarterly article, Rooney offers that one policy that “would likely attenuate the decline of small donors” is the reinstatement of the universal charitable deduction, also called an above-the-line or non-itemizer deduction. The likely beneficiaries of the expanded giving incentive would most likely be small and medium-sized organizations in local communities that largely are overlooked by rich donors. Several bills to create a deduction for all taxpayers have been introduced in Congress, but, given their projected costs to the federal treasury, will require extensive and prolonged advocacy efforts. Tax Reform 2.0: The House Ways and Means Committee, on a party line vote, approved additional tax cuts, dubbed “Tax Reform 2.0” by Committee Republicans, that would permanently extend the individual tax rate changes enacted last December, but set to expire at the end of 2025. The legislation would also make permanent the $10,000 cap on the deduction of state and local taxes (SALT). The tax committee also approved bills on retirement savings and business investment. Combined, the three bills approved by the Committee would cost $657 billion according the nonpartisan Joint Committee on Taxation. Other estimates peg the costs of permanently extending the tax cuts to between $3 trillion and $5 trillion. The full House may consider the measures in the last week of September, but the Senate is not expected to take action. Donor Disclosure Stayed: A court order invalidating a Federal Election Commissions (FEC) regulation that allowed donors to social welfare nonprofits to remain anonymous was put on hold (stayed) by U.S. Supreme Court Chief Justice Roberts over the weekend. The federal district judge in the case involving Crossroads GPS, one of the most politically active 501(c)(4) organizations, had ruled, "The challenged regulation … blatantly undercuts the congressional goal of fully disclosing the sources of money flowing into federal political campaigns.” In his order, Chief Justice Roberts wrote that the case “is hereby stayed pending further order of the undersigned or of the Court.” The lower court order was scheduled to go into effect on September 17. Donor Disclosure Required: A California requirement that charitable nonprofits disclose the names of large donors to the state Attorney General does not place a significant burden on the nonprofits’ First Amendment right to free speech, according to a federal circuit court ruling. Charitable nonprofits and foundations are already required to disclose these donors to the IRS on their Form 990 Schedule B, but the California Attorney General also requires the filing of an unredacted version of Schedule B with its office. Under both the federal and California mandates, the names of donors must be protected from public disclosure. The appellate court reversed the district judge’s ruling that the groups did not need to submit donor lists to the state registry. The State successfully argued that the disclosure requirement allows regulators to protect the public against fraud or unfair business practices. The plaintiffs may appeal to the U.S. Supreme Court. Marketing Mail Proposed Changes: USPS Marketing Mail would be restricted to only “paper-based/printer matter,” under proposed rulemaking by the United State Postal Service. Currently nonprofits often use Marketing Mail for merchandise premiums like calendars, grocery bags, address labels, clothing, pens, flashlights, and other items with their fundraising solicitations. These items would be expressly prohibited under the Marketing Mail rate. The proposed rate would apply to all Marketing Mail, regular and nonprofit, letter-size and flat-size. The U.S. Postal service is asking for public comments on the proposed rules by October 22. Nonprofits with grants from the Environmental Protection Agency (EPA) face new regulations for reimbursement of indirect costs beginning October 1, 2018. In late August, the EPA released a policy document, Indirect Cost Policy for Recipients of EPA Assistance Agreements, that purports to align EPA’s requirements for payment of indirect costs with the Office of Management and Budget (OMB) Uniform Guidance that went into effect in late 2014. The OMB rules establish important protections for charitable nonprofits providing services for state and local governments, including mandated reimbursement for indirect costs. However, while the new EPA policy was supposedly developed in the name of compliance, it includes a number of questionable differences that appear to contradict federal law and put EPA out of compliance by undermining the Uniform Guidance in many important areas. Nonprofits with grants directly or indirectly from EPA need to press grants managers about the variances and seek input from OMB to get straight answers on indirect cost reimbursement and other issues in dispute. Some state officials are still deciding on the best path forward to protect their residents from increasing state tax liabilities caused by the federal repeal of various deductions and the automatic effect on state tax law. The Minnesota Department of Revenue is responding by letting taxpayers choose for tax year 2018 whether to itemize their deductions or take the standard deduction on their state and federal forms. Normally, taxpayers in the state are required to use the same deduction for both. The option will allow taxpayers to avoid some state tax increases, as well as create an incentive for them to donate to charitable nonprofits and foundations to receive the charitable deduction. Officials in Idaho are analyzing a $12.7 million shortfall from revenue projections that could be caused by newly-reduced individual state income tax rates or pay that is “under-withheld” under the new federal tax law that results in a larger paycheck now, but higher tax liability at the end of the year. Two states are removing currently eligible Medicaid recipients or denying new access to the program because of policy shifts. Arkansas, with the Trump Administration’s approval, has removed nearly 4,600 Medicaid recipients from their benefits for the rest of the year due to new work and volunteer requirements. The state now mandates that recipients work, go to school, volunteer at a nonprofit, or be searching for a job for at least 80 hours per month to be eligible for the program. See the National Council of Nonprofits’ position on mandatory volunteerism. Maine Governor LePage stated he will not allow the state to approve Medicaid applications until legislators provide funding to pay for a voter-approved expansion of the program. Last year voters adopted a plan to provide Medicaid coverage for an additional 70,000 to 80,000 low-income residents. The Governor, who opposed the expansion, refused to take action until ordered by a court to do so. His administration has submitted the necessary paperwork to the federal government, but the Governor is personally lobbying the U.S. Department of Health and Human Services to reject the plan. Business Privilege Tax: Hospitals in Allentown, Pennsylvania are responding with legal action against a newly enforced business privilege tax on portions of their operations that the City deems to be “profit-generating.” The hospitals and other nonprofits have been charged back taxes dating to 2012 on these operations, and the Good Shepherd Rehabilitation Network system filed suit against the City for the assessments. It is also challenging the “aggressive” collection of the tax, relying on privacy laws as the basis for the claim. Nonprofits are exempt under state law from the business privilege tax, but they must file for the exemption every three years. The City is looking to expand the tax to include all businesses, including nonprofits. Property Tax: California has updated a property tax rule to permit multijurisdictional assessment appeals boards. The change authorizes county boards of supervisors from multiple counties to establish the boards. The expectation is that they will be able to equalize the valuation of taxable property for their counties, a challenge that nonprofits throughout the country face as local property tax assessors develop novel and inconsistent interpretations of state law to generate more revenue. Sales Taxes: A key Nebraska legislator has announced that all sales tax exemptions are on the table in the 2019 legislative session as lawmakers seek to reduce property tax rates. The state currently exempts hundreds of types of goods, services, and organizations from paying or collecting sales taxes. The Legislature tried earlier this year to address property tax rates through income tax and other reforms, including one proposal to impose new taxes on nonprofits. T-minus 8 days until National Voter Registration Day on September 25. All nonprofits have the opportunity to participate in this nonpartisan civic engagement to help people register to vote. Nonprofits are where people come to address personal needs, find solutions, and work together to help their communities. Voting gives those with whom your nonprofit engages the ability to further shape how their communities are run, tap into available resources, and, most importantly, afford them the opportunity to be heard. Go to Nonprofit VOTE for guidance on how nonprofits, in a nonpartisan way, can help make sure that every citizen’s voice is heard in each election. And while you are getting everyone else engaged, don’t forget to register yourself! Get a bigger boat. Betty’s not riffing on the classic line from Jaws, but stressing, “The more voices there are to carry your message, the further it will go.” And this advice is key: “The most effective spokespeople are often those who don’t benefit directly from your success.” She points out that human service providers can be excellent advocates for the arts, artists can effectively promote public safety, etc. “Bigger boats” are needed when coalitions grow to include many diverse allies. On this point, we always want to share that often the best advocates for an organization’s mission are the volunteer board members. Check out the resources in the Stand for Your Mission campaign dedicated to connecting board members to their inner (and innate) advocate. So whether it’s Day One or Day 1001 of an advocacy campaign, we agree that it's helpful to reflect on these experience-borne tips for success. An accurate 2020 Census count is critical to the allocation of more than $600 billion in governmental resources, as well as creating the data for electoral redistricting and nonprofit planning decisions. Join this webinar for an overview of how your nonprofit can get involved and leverage local funding to support participation. Register Now! ~ Rev. 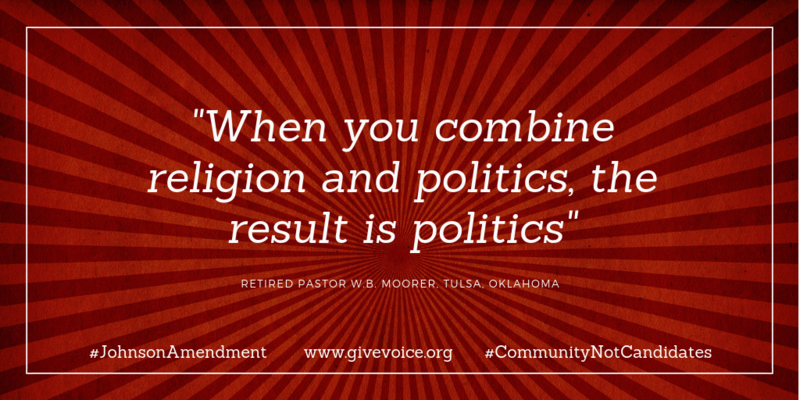 Carol McEntyre, senior pastor of First Baptist Church in Columbia, MO, writing in Johnson Amendment is good for churches, St. Louis Post-Dispatch, September 4, 2018, correcting misstatements made during an electoral campaign about the law that protects nonprofit nonpartisanship. ~ Diane Drollinger, Network for Strong Communities, and Deborah Dubin, Gateway Center for Giving, both in St. Louis, writing in Tax-deductible partisanship can cause rifts, St. Louis Business Journal, September 12, 2018. "People really give because they care and they can give more because of a tax incentive. So people are paying attention to tax incentives for charitable giving." Taylor Putz with Minnesota Council of Nonprofits, quoted in Minnesota cuts taxpayers a break on 2018 deductions, Minnesota Public Radio, September 4, 2018. ~ Preamble to the U.S. Constitution, Happy Constitution Day, September 17. From Poverty To Rocket Scientist To CEO, A Girl Scout's Inspiring Story, NPR, September 5, 2018, an interview with Girls Scouts CEO Sylvia Acevedo about the impact of the nonprofit in shaping her career and a discussion of Acevedo’s new children’s book, Path to the Stars: My Journey from Girl Scout to Rocket Scientist. 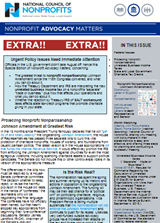 Nonprofit Advocacy Matters, Special Edition, August 27, 2018, providing information nonprofits can directly apply on the challenges to the Johnson Amendment and proposed regulations relating to unrelated business income taxes (“silo-ing”) and SALT workaround and other state tax-credit programs. ~ Marnie Taylor, President and CEO of the Oklahoma Center for Nonprofit, Elections are set and nonprofits should be ready!, September 6, 2018. City Fiscal Conditions 2018, National League of Cities, September 10, 2018, reporting a slowing of all types of tax revenue growth in America’s cities and increases in service costs and other expenditures. Habitat for Humanity CEO on the Far-Reaching Impact of Better Housing (33:09), Business of Giving Podcast, August 26, 2018, discussing the multiple benefits to individuals and communities that result from implementing proper housing solutions. Number of current state tax credit programs in 32 states and the District of Columbia potentially affected by proposed regulations from Treasury and the IRS that would change how and how much taxpayers can claim as charitable donations. Source: Appendix to “State Responses to Federal Tax Reform: Charitable Tax Credits," State Tax Notes (premium), April 30, 2018.